تحولات فزاینده در صنعت رسانه، مدیریت شرکت‌های فعال در این صنعت را به طور کامل دگرگون کرده است. در گذشته، شرکت‌های رسانه‌ای، بنگاه‌های بزرگی بودند که کلیه فرایندهای ایجاد ارزش را درون سازمان خود ایجاد می‌کردند اما امروزه با پدید آمدن شرکت‌هایی از صنایع غیر رسانه‌ای و گسترش حضور رسانه‌ها در عرصه‌های جدید، امکان اجرای تمام مراحل تولید آثار رسانه‌ای، تنها از طریق یک شرکت، از میان رفته است و شرکت‌های رسانه‌ای ناگزیر از به‌ کارگیری توانایی شرکت‌های دیگر در این حوزه هستند. مقاله حاضر، با پرداختن به این موضوع که ائتلاف‌های راهبردی چگونه می‌توانند ساز‌و‌کاری برای تعامل با محیط جدید رسانه‌ای پدید ‌آورند، تلاش کرده است که در حوزه اقتصاد رسانه، به تبیین رویکردهای ایجاد هم‌افزایی و ارزش افزوده در صنعت رسانه بپردازد. بر اساس این پژوهش که با رویکرد اکتشافی و با مطالعه کتابخانه‌ای، به تبیین ابعاد گوناگون ایجاد شبکه مشارکتی و ائتلاف راهبردی میان شرکت‌های دارای مزیت‌های رقابتی مکمل پرداخته است، چنین رویکردی می‌تواند به تحقق قابلیت‌ درونی شرکت‌های رسانه‌ای بینجامد. Increasing developments in media industry has remarkably affected the management of companies engaged in this industry. In past, media companies were big institutes embedding the whole process of value-creating. However, nowadays non-media companies are involved in the business of media, and media do non-media stuff; that’s why carrying out all media productions’ stages through a single company is impossible and media companies have no choice but employ other companies to contribute to their their job. The present article aims to examine how strategic alliances could provide a mechanism for interaction with media new environment. Employing media economics concepts, the article further tries to shed lights on approaches to creating synergy and value-adding in media industry. Given the results of the research which employed an explorative and descriptive methodology and explained how it is possible to develop a participative network and a strategic alliance among companies enjoying complimentary competitive advantages, such an approach could realize internal capabilities of media companies. آسابرگر، آرتور. (1379). رو‌ش‌های پژوهش در رسانه‌ها (ترجمه محمد حفاظی). تهران: دفتر مطالعات رسانه‌ها. خواجه‌ئیان، داتیس؛ فرهنگی، علی‌اکبر و هادوی‌نیا، عباس. (1388). طراحی مدل تعاملی مدیریت رسانه و فناوری‌های نوین اطلاعاتی و ارتباطی. فصلنامه پژوهش‌های ارتباطی، 60. ویمر، راجر. 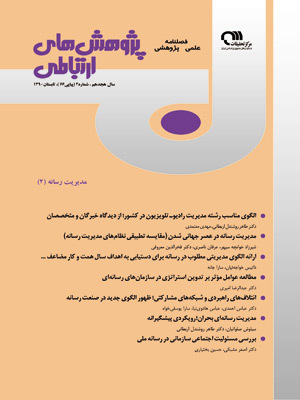 دی و دومینیک، جوزف آر. (1384). تحقیق در رسانه‌های جمعی (ترجمه دکتر کاووس سید امامی). تهران: سروش. Click, R.L. & Duening, T.N. (2006). Business Process Outsourcing. New York: John Wiley & Sons. Doyle, G. (2002). Understanding media economics. London: Sage. Doz, Y.L. & Hamel, G. (1998). Alliance advantage: The art of creating value through partnering. Boston, Massachusetts: Harvard Business School Press. Einstein, M. (2004). Media Diversity; Economics, Ownership and FCC. New York: Lawrence Erlbaum Associates. Frankel, R. & Whipple, J.S. (1999). Testing a model of long-term alliance success. Hospital-Material Management Quarterly, May, 20, 4, 55-59. Hanson, D.; Dowling, P.J. ; Hitt, M.A. ; Ireland, R.D., & Hoskisson, R.E. (2005). Strategic Management: Competitiveness and Globalisation. 2nd edn, Melbourne: Thomson. Johnson, G. & Scholes, K. (2002). Exploring Corporate Strategy. sixth edition. New York: Prentice Hall. Karagiannidis, V. (2008). Cooperative Satisfaction Factors for Effective Strategic Alliances in the Australian Telecommunications Industry. thesis for doctor of philosophy in business administration, Melbourne: Victoria University. Machin, D. & V. Leeuwen, T. (2007). Global media discourse; A critical introduction. London: Routledge. Napoli, P. (2003). Audience Economics; Media institutions and the audience marketplace. New York: Columbia University Press. Picard, R.G. (2005). Unique Characteristics and Business Dynamics of Media Products. Journal of Media Business Studies, Vol. 2 (2), pp. 61-69. Spekman, R.E., Isabella, L.A. & MacAvoy, T.C. (2000). Alliance competence: Maximising the value of your partnership. New York: John Wiley & Sons. Turow, J. (2009). Media Today, An introduction to mass communication. 3rd edition, London: Routledge. Vizjak, A. & Spiegel, A. (2003). Organization for Global Players in the media industry in Media Management; leveraging Content for Profitable Growth, Spring, Heidleberg. Weis, M. & Schuster, M. (2003).Eco-systems; a new paradigm in the media industry in Media Management; leveraging Content for profitable Growth, Spring, Heidleberg.